It's a soft night, by which I mean zephyrs, low humidity and pink haze. Dinner is fixed and the Offering Kidlets eat it; I sit outside with my Chateau La Roche Saint Jean sauv and savour the birdsong. Life is pretty damn good. We got pummeled over the weekend by a series of t-storms and so many of the blooms have shed their petals, but there are still enough to convey the splendor. 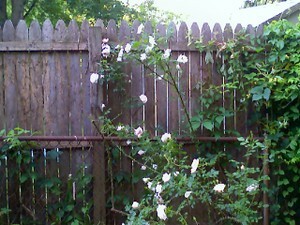 I love roses; so much reward for such little effort. Prune and feed them at the start of the season; feed them every six weeks thereafter; spray them with Neem once a week; deadhead them. That's it! And see how you are rewarded! I can hear TLO two houses over with The Youngest P and Wee Bree. Mrs. P calls to them; it's her orchestra night, so TLO will be coming home soon. UO shows up and TLO makes an appearence. It's her school field day tomorrow and she grills him as only a true flirt can: "What country am I tomorrow?" "Benin." "No!" "New Zealand." "NO!" "ITA..." "Not Germany." "NOOOOO..." "Hmm...institutionally governed by a weak head of state?" "DADDY!!!" And so it goes.